Another important “threshold” has been passed in the Uzbek currency market: the US dollar now trades at over 5,000 soums. 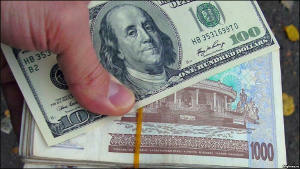 Illegal currency converters on the market are purchasing the US dollar at 4,950 soums and selling at 5,030. 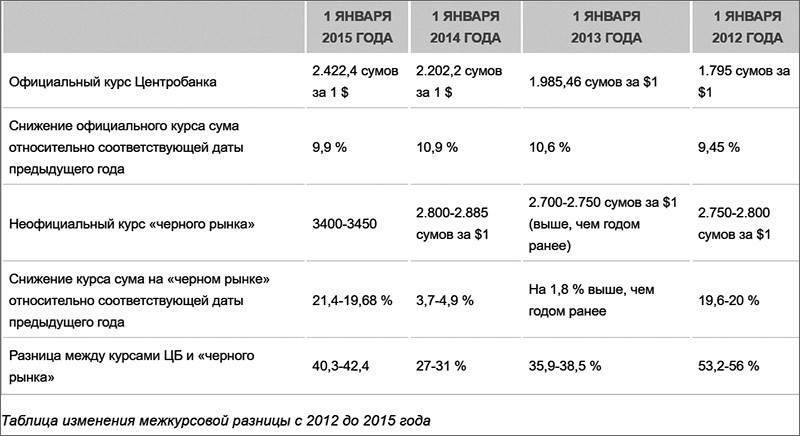 Thus, the value of the Uzbek national currency dropped 45.7% since the beginning of this year. The soum did drop to these lows in mid-May this year: the currency suddenly dropped from 4,100-4,200 to 5,000-5,200 per dollar overnight, prompting speculations about a sudden devaluation of the Uzbek currency. The authorities got immediately involved with various non-market methods, forcing the exchange rate drop somewhat, remain at 4,600-4,650, and eventually drop to lower levels, including to levels lower than pre-skyrocketing rates. That said, the “bazaar” exchange rate has been inching up over the last four months and has eventually exceeded the mark passed in May. Background: The percentage ratio of the Uzbek soum’s devaluation compared to the dollar has the following pattern thus far: the US dollar gained 3.7-4.9% in 2013; 21.4-19.7% in 2014; and 45.7% since January 2015 (from 3,400-3,450 to 4,950-5,030 soums). Meanwhile, the official exchange rate added only 8.8% thanks to the artificial support of the soum the country’s Central Bank provides. The anticipated outcome of the soum’s rapid devaluation in the “black market” is the increasing gap between the official and “bazaar” exchange rates. For instance, the “inter-exchange rate” gap—an indicator of corruption levels of sorts—was just over 27%; by early 2015 the gap increased up to 40.35-42.4%; on October 12, the gap in question was 87.8-90.9%. Thus, mid-October levels hit all-time high records over the last 13 years. While this “inter-exchange rate” discrepancy spells doom for the country’s economy, it is extremely profitable for those in highest echelons of power, since it allows them “privileged” access to the hard currency at the Central Bank-set rates. Hence, the larger the gap the more there are opportunities to reap super-profits. This is the main reason for the lack of free currency exchange in the country. But the country’s authorities persistently “fail to notice” the unofficial exchange market. 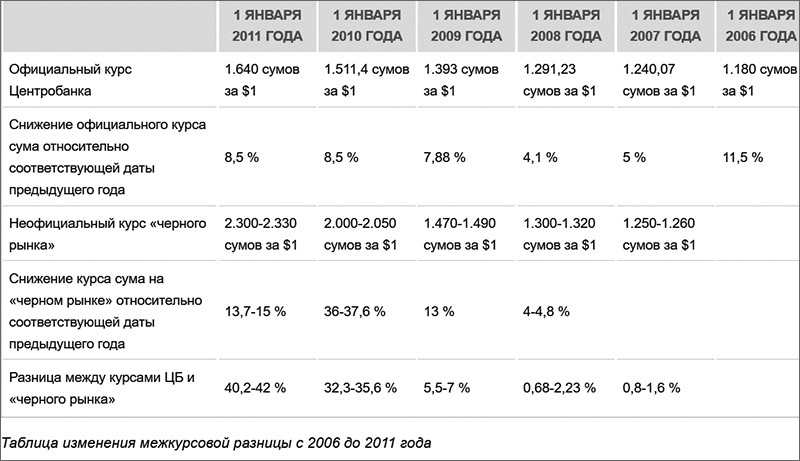 The “bazaar” exchange rate of the US dollar, euro, ruble and tenge is not mentioned anywhere, not even by the local mass media outlets save isolated individual cases even though the absolute majority of the Uzbek citizens do transactions using this currency because the “cheap” exchange rate is simply inaccessible for them. Meanwhile, against this entire backdrop, the Uzbek citizens are officially prohibited from purchasing hard currency, and sale/purchase of foreign currency in the “black market” is a crime, which provides for a significant fine or imprisonment for not more than three years. President Islam Karimov refuses to accept the reality; in his speeches at the years-end, he continues to claim the inflation did not exceed 6-8%. According to the head of state, the inflation reached 6.8% in 2013; 6.1% in 2014 (even though all prices for goods and services, save several government-guaranteed items, are pegged onto the “black market”). One must not be surprised to hear the same numbers from him late December 2015.